The day before Thanksgiving, Noah came home from school with a paper turkey he’d cut out and colored. It had three feathers with the pre-printed words “Doy gracias por” (“I give thanks for”). He’d filled in the blanks with “comida” (“food”), “agua” (“water”) and “mi abuela” (“my grandmother”). He’d included food and water, he explained to me, “because no one can survive” without them. He looked at the last feather. “I have two grandmothers,” he commented, as if I didn’t know. Food water and love, I thought, that’s why we give thanks. I wonder if this is how I sound to her when I sing it. Anyway, my fatigue, combined with the astoundingly repetitive adventures of Jack and Annie recounted in the stilted prose of Mary Pope Osbourne knocked me right out. I missed several chapters. We arrived mid-afternoon and dinner wasn’t until seven, so we had time for the kids to burn off some pent-up energy running around outside and for me to bathe June before we got the kids dressed for dinner. June wore a dress with a black velvet top and a puffy, gold satin skirt that a friend of Andrea’s bought for her. Andrea said she looked just like a doll. Beth’s brother Johnny and I both said, independently of each other, that she looked like the Infanta Margarita in this painting (http://www.artchive.com/meninas.htm). 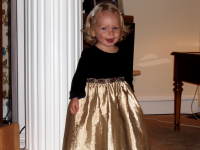 In either case, doll or princess, it was a new look for her. 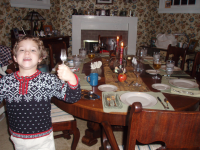 Johnny organized Thanksgiving dinner, making cooking assignments that spread the work out among the diners. He and his wife Abby did the bulk of the cooking, making the turkey and stuffing, the mashed potatoes and a dish of broiled squash and parsnips; with Beth and I bringing the vegetarian gravy, green bean casserole and brandied sweet potatoes; Beth’s father John making the turkey gravy; and Andrea making the cranberry sauce and pumpkin pie. Noah and I made turkey centerpieces out of apples, toothpicks, raisins, green olives and pistachios. Everyone got his or her favorite dish and Andrea exclaimed over and over again how thankful she was to have her children do most of the cooking. Dinner finished up late so we let Noah and June eat their pie (or in June’s case, just the whipped cream off the top) before everyone else and we hustled them off the bed. I decided to forgo pie so I could get to bed myself. I paused only to put the kids’ cranberry-stained clothes to soak in the bathtub. I wanted everyone to get a good night’s rest. Noah was awake for a while singing “The Lion Sleeps Tonight,” but by 9:30 all three of us were fast asleep in our shared attic bedroom. June woke at 9:45. I popped the pacifier back in and she went back to sleep. Noah fell out of bed at 10:55. I helped him back in. Beth stayed up late chatting with Johnny and came to bed at 11:20. At last, everyone was settled in. We slept until 3:15, when all hell broke loose. It started out pretty normal. June woke and wanted to nurse. “Nap!” she insisted when I tried the pacifier. (Nursing and sleeping are so intertwined in her mind that this is her word for nursing.) I was still down on her mat with her when Noah woke at 3:25 and wanted help going to the bathroom. Beth got up to help him. And then neither of the kids went back to sleep. Around 3:45, Beth and June switched places. The bed was a double, too small for the three of us, and I thought June might sleep better with me, but it took another hour to get her to drop off. Meanwhile, Beth slept fitfully on the mat on the floor and Noah was wide-awake on the airbed next to me. He rolled around in bed. He sat up and watched the numbers change on the digital clock. He made shadow puppets in the light from the nightlight. He sang softly, but audibly, under his breath. He whispered numbers divisible by both two and five to himself. He saw scary shapes in the dark and needed me to drape blankets over them. He got up to go to the bathroom multiple times. I tried patiently telling him to lie still, be quiet and go to sleep. I tried scolding him. I tried ignoring him. At 6:00 on the dot he jumped out of bed and was dashing around the corner heading for Beth’s mat. I stopped him and he protested it was time for Beth to get up and play with him. He seemed to have genuinely forgotten that he hasn’t been allowed to wake us at 6:00 since July. The new time is 6:30. At 6:30, having just finished nursing June again, I got up to find him some socks (he’d been complaining of cold feet) and a book. I was meaning to banish him downstairs and try to get back to sleep after having been awake for over three hours. But June woke while I was searching for Noah’s suitcase in the dark room and her crying woke Beth and soon the four of us were all downstairs and up for the day. And that’s how Beth’s forty-first birthday began. Last year on the evening of the day after Beth’s fortieth birthday, we got even less sleep, at least she and I did. Shortly after going to bed that night she had a gallbladder attack. We were at my mother and stepfather’s house for Thanksgiving and my mom took her to the emergency room while I stayed home with the kids. They were there almost all night. I was sick with worry, thinking it was a heart attack and slept little. I cuddled with June all night, nursing her when she woke. Beth and my mom returned close to dawn with the news that it was her gallbladder and she’d have to have it out but she was going to be okay. When Noah and June woke I quickly got them dressed and fed and out of the house so Beth and my mom could get some sleep. We wandered around town all morning, hanging out in a local coffee shop and the public library. We came home around lunchtime to find everyone awake and Beth still alive. I am often cranky and out of sorts after a bad night, but all that day I was deliriously, giddily happy because Beth had not been taken from me. I wondered if it would be possible to somehow hold on to that happiness, that pure thankfulness without an intervening crisis. I suspected it would not. The petty annoyances of life have such power to drag us down. Still, I wanted to try. It’s a year later now and I can’t say I’ve never been frustrated, bored or angry. I can’t say I’ve never lost sight of the big picture and forgotten all my blessings. But I often remember that night, and that day, two days after Thanksgiving, and when I do, I try to give thanks. Noah and I decorated Beth’s cake right after breakfast. 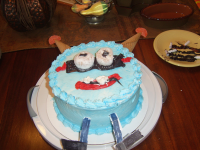 He had his heart set on a cake decorated like Buzz, the villain’s robot henchman from Cyberchase (because a Buzz cake is what every forty-something mom secretly years for). I wondered if I was losing a key pre-Christmas opportunity here to work on the concept of giving what the recipient wants instead of what you would want, but he was just so earnest and excited about the idea I caved. To compound matters, I also let him get her a pirate-themed game for her gift after he offered to chip in five dollars of his own money (more than a month’s allowance). Johnny and Abby took Noah out to lunch and to a science museum in Pittsburgh and they were gone six hours. Andrea’s sister Sue, her stepdaughter in-law Melody and Melody’s eighteen-month-old daughter Lily visited in the morning. After lunch, June and I crashed, taking a long nap. Beth and Andrea braved the Black Friday crowds and went shopping. Andrea bought Beth an iPhone that consumed her attention for the rest of the day and a pointer light to amuse Scarlet the cat. I think Beth’s dad had as much fun making the cat chase the streaking red light as she did chasing it. June and I watched five deer (which June insisted were camels) graze in the backyard. Johnny, Abby and a very sleepy Noah returned from their adventures (he’d slept all the way home) and regaled us with tales of the model trains and the real submarine they’d seen. We had Chinese takeout and cake for dinner and watched an episode of Fraggle Rock, which Johnny remembers fondly. (He was eleven to Beth’s fifteen when it came out and he actually watched it back then, which neither Beth nor I did.) Johnny’s a real Renaissance man, appreciating both seventeenth-century Spanish art and 1980s pop culture. I like that about him. Just before bed, when we brought the kids downstairs to say goodnight to everyone, Noah and Andrea sang a duet of the first two verses of “Down in the Valley.” (It was late and he had to be dissuaded from singing all five.) When they got to the line “Angels in heaven know I love you,” Andrea enveloped him in a big, grandmotherly hug. Even with a nap, I was crazy tired all day and not beside myself with joy, but still quietly, deeply, truly thankful, for food, for water and for love. This entry was posted in Anniversaries, Birthdays and Half-Birthdays, Extended Family, Holidays, Travel by Steph. Bookmark the permalink.